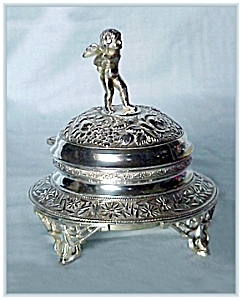 This is a cute American Victorian silverplate repousse jewelry box. A cherub is standing on the lid. It is 5½" in height and 3" in diameter at the opening. It has been resilvered. The manufacturer's mark is Meriden #1173.